Purpose – a simple word – but when left without it in our lives, there is a profound effect on our happiness. I had never given thought to what would happen if I didn’t have purpose, until recently when I saw firsthand what happens when someone’s purpose is taken away. Ironically, it was my dog who taught me this valuable lesson. Toby became part of my family when he was 6-weeks old. This lovable West Highland Terrier has always been happy to see me, from the first day I walked into his life and decided to take him home. He loves me – I am his “Mommy” and he loves my sons – the rest of his family. In addition to his family, Toby also loves squirrels. He spends most of his time chasing the neighborhood squirrels in the backyard. When I watch the exchange between Toby and the squirrels, it’s like they’re playmates – deliberately making sure each other knows they’re around. 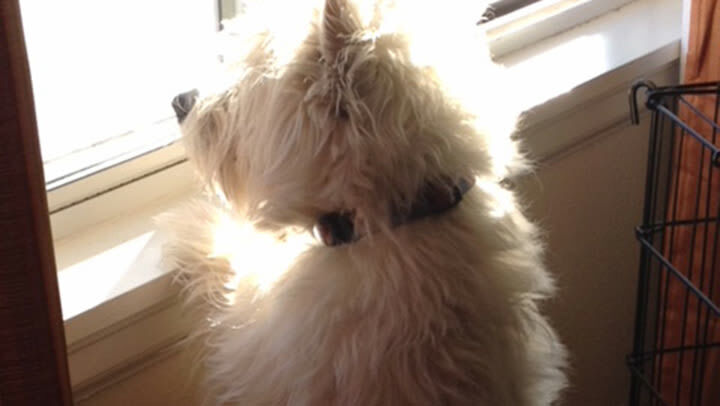 Toby’s purpose with the squirrels is left to one’s imagination because he cannot talk, but I believe it is to keep them in check and out of his yard. It wasn’t until I moved to a condo and took Toby with me that I realized exactly what squirrels meant to Toby. Without them, he had no purpose. At the condo, my fun-loving, peppy dog was miserable. He spent his time lying on the floor next to the door wishing to complete his purpose – spending time with the squirrels. His depression turned into anxiety, resulting in three trips to the vet and $600 worth of bills to help his “angry” digestive system. After the last trip to the vet, I reluctantly took Toby back to the townhouse with a yard, realizing that his purpose was far more important than spending time on my lap. After just two days, he was back to himself. When I visit, he’s still very happy to see me – but I’m not his purpose. The lesson I learned is this: each one of us needs to wake up in the morning and have something that fulfills us – our purpose. While personal relationships are also important – Toby has his other family members – one must have both to truly be happy. As a senior living professional, I am fortunate to work with an organization that subscribes to the concept of providing purpose to everyone we come in contact with – residents, fellow team members and family members. I believe in the value purpose provides. For me, my professional purpose is to provide my team members with the tools they need to succeed and to celebrate our triumphs. Everyone’s purpose is different, and how wonderful it is to see residents find their purpose in the context of community living – it’s exciting to watch! Written by Jill Hiller, the Regional Sales and Marketing Director for Cappella Living Solutions, the company that manages Casey's Pond.